Over that last few years there has been a significant growth in the number of pre-qualified packaging systems available for the temperature-sensitive pharmaceutical/biological industry to use during the cold chain transportation process. The pharmaceutical products must be shipped within their required temperature range, such as frozen, refrigerated, and control-room temperature. The “off-the-shelf” pre-qualified solutions are developed and qualified to maintain the designated temperature during shipping for durations such as 24, 48, or 72 hours. While the pre-qualified solutions may seem like a good option because the design work has already been completed, if the design criteria do not meet the actual usage, the package may not be effective. By simply understanding a few key variables that go into the design, testing, and real-life practices of temperature sensitive shipping containers, it is possible to determine if a pre-qualified shipper or a customized solution would be best based on risk, cost, and ease of integration. Pre-qualified shipping containers are tested using specific criteria, which allows them to be qualified for those specific conditions. If the end user's variables are not analogous to the qualification criteria, the pre-qualified container is at risk for not maintaining the appropriate temperature range and may not be cost efficient. A pre-qualified container is only useful and cost effective if all the tested criteria are realistic to the end user's facility and shipping environment. If any of the variables are different, taking the time and cost upfront to design a custom solution will lead to longer-term performance, reliability, and cost savings. When evaluating pre-qualified or customized packaging solutions, the shipping temperature profile is the most important parameter. The temperature profile is used to represent the environmental temperatures that the shipping container will encounter during transportation. If the pre-qualified container was tested and pre-qualified to a temperature profile that differs than the actual profile seen during the user’s transportation process, the container may not protect the payload from temperatures outside of the required temperature range. 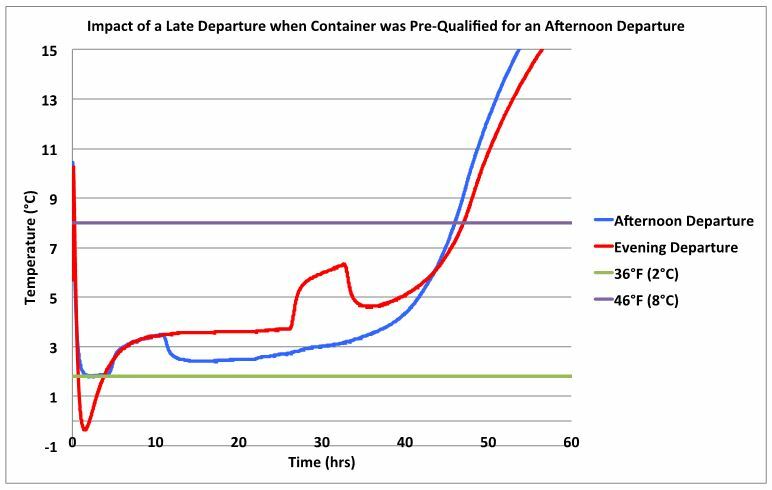 Figure 1 below demonstrates how the temperature profile used to pre-qualify the container directly impacts the duration that it can maintain the required temperature range. The container in Figure 1 was designed to maintain 36-46oF (2-8oC) for 45 hours when exposed to a temperature profile with a peak temperature of 95oF (35oC). The red line shows how temperature was maintained for the required duration. However, the blue line shows that same container only maintained the required temperature range for 33 hours because it was exposed to a higher peak temperature of 113oF (45oC). In contrast, protecting for temperatures and shipping durations that are not encountered in the user's actual shipping environment could mean the use of an over-designed, pre-qualified container. Over-designed packages lead to unnecessary packaging components, which directly translate to increased package costs, increased shipping costs, and increased component and packing complexity. Consideration of the end user's facility storage times, facility storage temperatures, and time the outbound transportation begins is critical when evaluating the effectiveness of a pre-qualified solution in a real life situation. The beginning portion of a temperature profile is just as important as the peak temperatures. The starting time of the temperature profile needs to be representative of the user's packing and shipping schedule. The temperature profile should begin from the time the lid is placed on the shipping package, while the starting temperature should be representative of the storage conditions before the outbound transportation begins. A container that is packed with ice packs and then stored in refrigerated conditions until the carrier service arrives will have a dramatically different performance than a package that remains at room temperature until carrier pick-up. The time the temperature profile begins should be representative of the actual environmental temperatures that the container will experience throughout the day. Since the outside environmental temperature, and thus the transportation temperature, fluctuates throughout the day, the high temperatures seen in the pre-qualified temperature testing profiles need to correlate with the time of the day the package will actually see the temperature peaks. Knowing the container’s packaging and transportation schedule is essential when determining if the pre-qualified containers temperature profile is representative of the end user's actual profile. Figure 2 demonstrates how the internal temperature of the same shipping container is affected by high temperature exposure at differing times. The blue line shows the internal temperature of the container when it was designed to see a high temperature early in the shipping process, such as departing the packing facility in the afternoon. The blue line stays within the required temperature range of 36-46oF (2-8oC). In contrast, the red line exhibits how the same container can cause the internal temperature to freeze when the departure schedule is not aligned with the timeframe for which the container’s temperature profile was designed. If the container was designed to begin transportation in the afternoon (as in the blue line) but did not depart until the evening (as with the red line), the container will not be exposed to the high temperature until the afternoon of the following day, which can cause the internal payload to freeze as it was not designed for that temperature profile. The same concept is important to realize for winter conditions where the package may be exposed to the coldest temperatures at night. 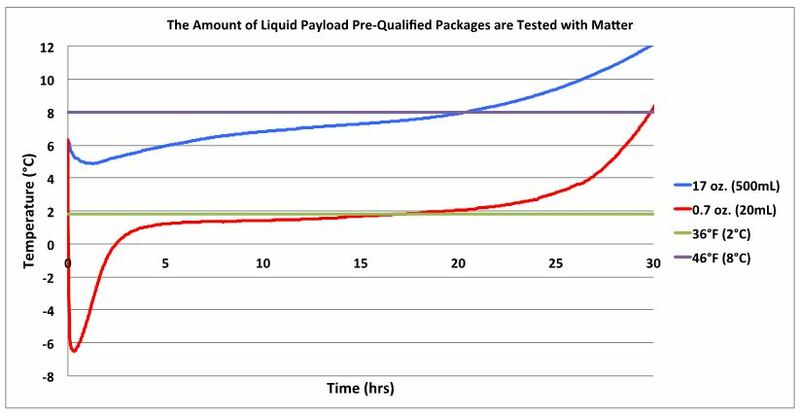 A properly designed qualification test will determine the duration the container has maintained the required temperature range by measuring the liquid payload temperature, as opposed to the air temperature inside the package. Knowing the approximate thermal mass of your payloads is essential when evaluating the effectiveness of a pre-qualified shipping container. Thermal mass is the ability of a substance to absorb and store energy. Payloads that have a large liquid volume have a high thermal mass and therefore will change temperature slower than smaller liquid volume payloads. Large volume payloads will stay within the temperature range for a longer period of time compared to small volumes, since it takes more energy to change the temperature of a large volume. As seen below in Figure 3, two of the same containers were exposed to the same temperature profile, except they contained different volumes of liquid payload. The package represented by the blue line contained a 17 oz. (500mL) volume payload where the red line contained a 0.7 oz. (20mL) volume payload. The smaller volume immediately exceeded the required temperature range of 36-46oF (2-8oC) as it dropped below 21oF (-6oC) and remained below 36oF (2oC) for 17 hours. In contrast the large volume payload shown with the blue line remained within the required temperature range for 20 hours. The small volume payload had a smaller thermal mass, causing the temperature to drop quicker with exposure to cold temperatures. Implementation of a pre-qualified container that underwent qualification testing using a payload volume that was larger than the user's actual payload volume could result in the container failing the temperature requirement. It is crucial that the user's shipping package be designed to work with a realistic payload. Table 1 outlines a few crucial variables that are necessary when evaluating a packaging solution for the shipment of temperature-sensitive pharmaceuticals. Before shopping for a pre-qualified solution or designing a customized container, the end user should determine their criteria for these variables. Using a pre-qualified shipping container is a useful tool when all the variables the container was pre-qualified to are the same parameters as the end user's. Customized solutions will result in cost savings as well as better temperature performance if any of the variables used to develop the pre-qualified containers variables differ from the end users. Taking the time to properly customize the development of a permanent shipping container will result in an optimal design that has the most effective temperature performance without incurring unnecessary costs.